In the immediate aftermath of the Second World War, and with British political influence over Greece soon to be ceded to the United States, there was a considerable degree of cultural interaction between Greek and British literati. Sponsored or assisted by the British Council, this interaction was notable for its diversity and quality alike. Indeed, the British Council in Greece made a more significant contribution to local culture in that period than at any other time, and perhaps in any other country. Many of the participants – among them Patrick Leigh Fermor, Steven Runciman, and Louis MacNeice – are well known, while others deserve to be better known than they are today. 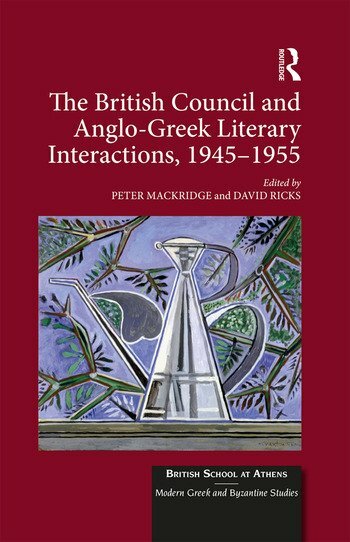 But what has been less fully discussed, and what the volume sets out to do, is to explore the two-way relations between Greek and British literary production in which the British Council played a particularly important role until the outbreak of armed conflict in Cyprus in 1955, which rendered further contacts of this kind difficult. Close attention is paid to the variety of ways – marked by personal affinities and allegiances, but also by political tensions – in which the British Council functioned as an agent of interaction in a climate where a complex blend of traditional Anglophilia or Philhellenism found itself encountering a new post-war and Cold War environment. What is distinctive about the volume, beyond the inclusion of much recent archival research, is its attention to the British Council as part of the story of Greek letters, and not just as a place in which various British men and women of letters worked. The British Council found itself, sometimes more through improvisation and personal affinities than through careful planning, at the heart of some key developments, notably in terms of important periodical publications which had a lasting influence on Greek letters. Though in the cultural forum that influence was arguably to be less pervasive than that of France, with its more ambitious cultural outreach, or than that of the USA in later decades, the role of the British Council in Greece in this crucial period of Greek (and indeed European) post-war history continues to make a rich case study in cultural politics. This volume thus fills a gap in the rich bibliography on Anglo-Greek relations and contributes to a wider scholarly and public discussion about cultural politics. Peter Mackridge was Professor of Modern Greek at the University of Oxford until his retirement in 2003 and is an Emeritus Fellow of St Cross College, Oxford. David Ricks is Professor of Modern Greek and Comparative Literature at King’s College London.